They are delicious! 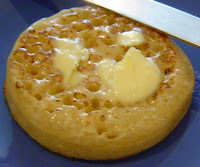 Hot, buttered (well, not butter, we’re not allowed that any more) crumpets in the morning with a cup of tea, what more could anyone want. Other than maybe a bacon cob. I am constantly amazed by the variety of food that flour makes, all based on how it’s mixed, how it’s handled after it’s mixed and how it’s cooked. I don’t know which is better (or least bad) for me, bacon cob or crumpets, but crumpets are my concession to myself for breakfast when I’m working from home and don’t want to risk buying bacon and eating too much of it.